In general, all OGS testing protocols allow the manufacturer to select any of their commercial model sizes as the test unit. Many professionals within the Canadian stormwater man­agement com­munity are familiar with the use of oil-grit separators (OGS) to remove pollutants. The very name of this class of treatment technology strongly suggests which pollutants are targeted for capture. Certainly, there are many products being marketed as being effective for separation of oil and sediment. However, a closer examination is required to determine if marketing claims really hold up. For instance, it is reasonable to assume that the terms “separation” and “capture” imply that separated/captured pollutant loads will accumulate within the device over time as more runoff volume is treated, and that these pollutants will be safely stored until cleanout. The expectation of the specifier, regulator and owner is that the captured sediment and oil will remain within the device, even during occasional high-intensity storm events that generate high influent flow rates. Retention of captured pollutants is a critical performance requirement. Simply capturing pollutants during relatively low-intensity storms, only to have them released during heavy downpours, is hardly effective treatment, and defeats the goal of protecting water resources. Therefore, it is appropriate that any testing programs designed to evaluate OGS performance characteristics include provisions to determine the propensity of a device to re-suspend/re-entrain and washout previously captured sediment and liquid hydrocarbons during high flow rate conditions. The term “oil-grit separator” is used commonly in Canada, while the same technology is typically referred to as a “hydrodynamic separator” in the U.S. It is interesting to note that standardized laboratory testing protocols in the U.S. (such as the New Jersey Department of Environmental Protection protocol) focus exclusively on capture and retention of sediment, while the recently established Canadian Environmental Technology Verification (ETV) protocol, “Procedure for Laboratory Testing of Oil-Grit Separators” contains provisions for evaluating capture and retention of sediment, as well as retention of floatable hydrocarbons. The advisory committee that developed the Canadian protocol included consultants, municipalities, conservation authorities, academics, and manufacturers. It recognized that testing of OGS devices needs to include provisions related to treatment of oil and fuel, which are pollutants of concern. After examining the strengths and weaknesses of pre-existing testing protocols for OGS devices, the advisory committee established provisions in the Canadian ETV protocol that make it more rigorous. It also provides improved comparability of performance results for various OGS devices. A series of laboratory tests is designed to reasonably predict real-world performance, with provisions for evaluating sediment capture, resuspension and washout (“scour”) of captured sediment and re-entrainment and washout of captured light liquids (oil and fuel). Essential aspects of the comparability objective include specifications for the test sediment used in the capture and scour evaluations, specifications for the floatable plastic beads used as an oil/fuel surrogate in the light liquid re-entrainment evaluation, and provisions for various flow rates expressed as specified surface loading rates for each of the tests. Additionally, the protocol specifies provisions to ensure that larger OGS sizes are suitably scaled relative to smaller tested devices. It also establishes the requirement for equivalence in treatment flow rate per unit of sedimentation surface area, as well as provisions for minimum depth of the device. These critical scaling requirements are intended to prevent the installation of poor-performing undersized devices that can result from the use of scientifically unproven scaling methods. The Canadian ETV protocol specifies a test sediment with particle size distribution (PSD) ranging from 1 – 1000 microns. This is considered reasonably representative of the particle size fractions found in typical urban stormwater runoff, and is commonly known as the “ETV PSD”. This specification is nearly identical to the specification for the test sediment used in the New Jersey lab protocol for the sediment capture test. 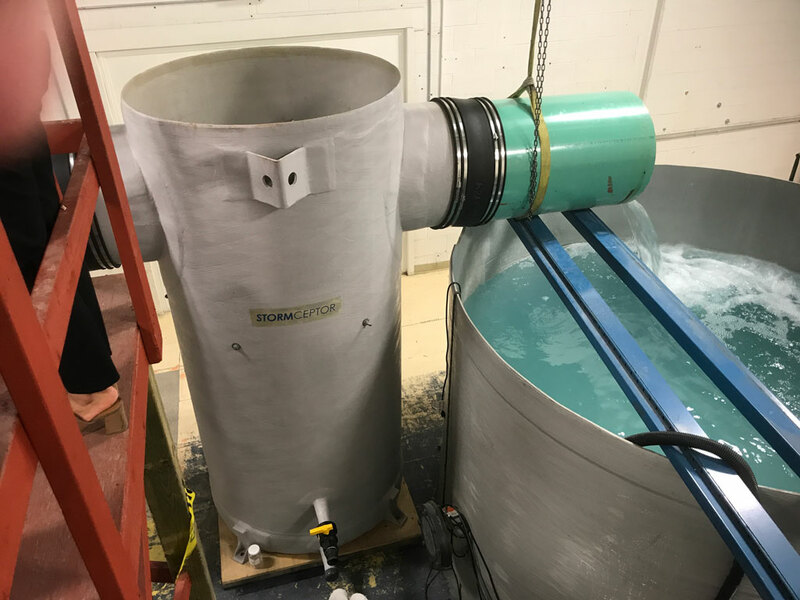 The Canadian protocol requires the ETV PSD to be added to the influent during the sediment capture test, and to be pre-loaded in the sump of the device prior to the sediment scour test. Unlike the New Jersey scour test provisions, which specify pre-loading the sump of the device with a coarser test sediment (no particles smaller than 50 microns), the use of the fines-containing ETV PSD and progressive effluent sampling methodology during scour testing is more rigorous and conservative. This is better representative of real-world conditions. OGS devices primarily target sediment particles larger than 50 microns during inflow events of moderate and high intensity. However, significant capture of particles smaller than 50 microns occurs during the frequent low-intensity events that comprise a substantial portion of the annual runoff volume. It also occurs during the quiescent settling periods between storms. Therefore, in the real world, a substantial amount of fines may be captured and present in the sump prior to a storm event of high intensity and high influent flow rates. The Canadian ETV scour test appropriately provides insight about fine sediment retention performance during such an event. Low density polyethylene beads, with a size range of 3.5 – 4.5 mm and specific gravity 0.917, are a convenient surrogate for oil and fuel during the light liquid re-entrainment simulation test. Unlike hydrocarbon liquids that are messy and pose effluent disposal and system clean-up challenges, these are easy to handle, simple to recover from the OGS device and from the effluent during testing by using a net. Also, they are easily quantified by mass and volume. A specified volume of beads is pre-loaded into the OGS device prior to testing. Beads washed out during testing are captured and quantified to determine how well the device performs in retaining them during flows that simulate a high-intensity storm event. This test sets the Canadian protocol apart from all other sediment-focused OGS test protocols by providing a simple, practical, and meaningful method for characterizing a very important aspect of OGS performance. In general, all OGS testing protocols allow the manufacturer to select any of their commercial model sizes as the test unit. For reasons of cost and laboratory hydraulic capacity, smaller model sizes are most commonly tested. Earlier testing protocols allow each OGS manufacturer to establish the flow rates for testing of their device. Combined with the variability in the size of models tested, this makes it very difficult to establish “apples-to-apples” comparability of performance between various devices. With comparability as a key objective of the Canadian ETV protocol, provisions were established that specify the influent surface loading rates that must be evaluated for each of the three performance tests. “Surface loading rate” is defined as the influent flow rate divided by the sedimentation surface area of the device. This is typically the cross-sectional surface area of the treatment chamber and is expressed in metric units as L/min/m2. Using a surface loading rate basis allows comparability between devices of various sizes. Seven different surface loading rates, ranging from 40 – 1400 L/min/m2, are specified for the sediment capture test, representing a range of storm events from low intensity to high intensity. Five different surface loading rates, ranging from 200 – 2600 L/min/m2, are specified for the sediment scour test and the light liquid re-entrainment simulation test, representing a range of storm events. Manufacturers who test their OGS device according to the Canadian ETV protocol must have testing independently performed by an accredited laboratory, and have the test results verified by an accredited third party. The resulting verification of performance claims is then posted on the Canadian ETV website. Proper interpretation of OGS performance testing results is important to ensure that the selected device will function as intended. An examination of the sediment capture results for the range of devices tested demonstrates that OGS devices are suitable for pretreatment applications, and can be reasonably sized to capture 60% of the ETV PSD on an annual basis. When installed upstream of ponds, detention facilities, bioretention, filters, and infiltration BMPs, OGS devices can remove a substantial portion of the sediment load from stormwater runoff. For sites where capture and retention of oil and fuel spills is important, such as fueling stations, convenience stores, fast food restaurants, accident-prone intersections, and other high traffic areas, it is important to select an OGS device that has demonstrated good performance during light liquid retention testing. Civil engineers generally prefer to have the OGS device installed in-line with the storm sewer infrastructure. The expectation is that the device has an effective internal bypass to convey excessive flows, and that it will retain accumulated sediment even during very high intensity storm events. Therefore, it is important that the performance testing demonstrates good results during scour testing. This is generally lower than 10 or 20 mg/L effluent sediment concentrations at the highest tested surface loading rates. The Canadian ETV testing protocol has established a high bar for performance evaluation of OGS devices. It provides the opportunity to assess marketing claims in light of verified third-party test results. In the interest of upgrading environmental protection, provincial, regional, and municipal regulatory authorities are encouraged to use this information for their stormwater quality programs. Joel Garbon is with Imbrium Systems. This article appears in ES&E’s February 2018 issue.